Your bathroom is one of the most frequented rooms in your house. Among other purposes, it provides a solitary space for introspection, quality alone time and escaping all life’s hassles for a brief period of time. Few rooms in a home see as much daily traffic as the bathroom, so it is essential that it is able to withstand years of repeated use and aging. When your sink, shower, lighting or any other element in your bathroom needs to be replaced, trust the professional bathroom remodeling team at TriStar Repair & Construction to give your lavatory space the facelift it needs. Bathroom remodeling is at the top of countless home renovation lists all over the Dallas–Fort Worth metroplex. Think about your home’s bathroom for a moment. What would you change? The sink? The shower? The floor treatment? Everything? 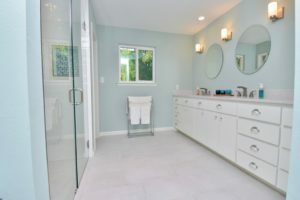 Before you begin the bathroom remodeling process, it is important to have a sound grasp on what you want to accomplish and map out what exactly needs to be done. This time of reflection and consideration will save you time down the road and ensure a fuller pocketbook. Whether you want your bathroom to convey a sleek, modern environment or a more traditional atmosphere, the bathroom remodeling team at TriStar is ready and able to transform your current bathroom into the bathroom of your dreams. Trust TriStar with Any Bathroom Remodeling Project! Thousands of people carry out bathroom remodeling projects every year. Some opt for the do-it-yourself route, and others hire a remodeling or construction company. Remodeling your own bathroom can be rewarding, but if you do not specialize in installing the various elements a bathroom requires, the project can prove to be overly expensive and cumbersome. The expert remodelers here at TriStar have been remodeling bathrooms since before we started doing business in 2006, so you can trust us to get the job done correctly. When you partner with TriStar Repair & Construction, you can count on our team to carry out your bathroom remodeling project as quickly, efficiently and cost effectively as possible. If your bathroom needs to be modernized, repaired or completely remodeled, contact TriStar Repair & Construction at (940) 381-2222 or send us a message. We will work with you to gain a sound understanding of your bathroom remodeling goals and will stop at nothing to meet them because we are not satisfied until you are!